Yes, we need many more Americans coming to Iran — and many more Iranians coming to the U.S. — so we can get to know one another, understand one another, and gain a greater appreciation of one another as people, and learn each other’s culture, history, and viewpoints. And the more of us who visit one another’s countries, and come home and share our experiences and the stories of some of the beautiful people we have met, the more Americans will encourage our political leaders to truly engage in diplomacy and negotiations and leave the guns and threats of war and violence at home – or even better, in the dustbins of history. 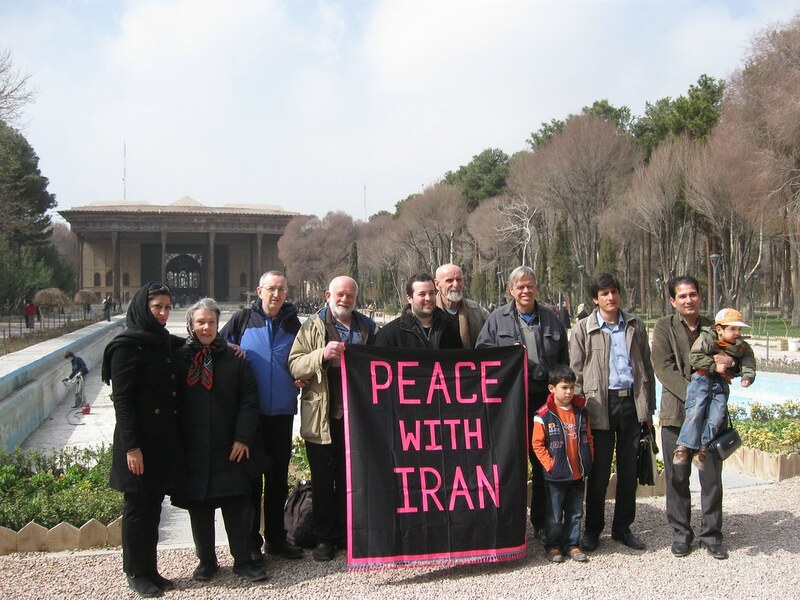 I was walking by a children’s playground in a park in Esfahan wearing a tee-shirt with the words inscribed on the front, PEACE WITH IRAN – in Farsi and English. A man came up to me with a big smile and said, "Thank you for your message. We are all children of one God under one sky on the same earth. We need to see ourselves as brothers and sisters and friends, not as Iranians or Americans or Muslims or Christians – or enemies." My new friend was named Hamid and turned out to be a fireman at the airport in Shiraz on holiday with his family in Esfahan. Hamid continued, "We need to teach our children the culture of peace – where we learn to love and respect one another. All religions teach us to love one another. We all need to practice our religious teachings and love one another." He talked of the influence of Sufis and of the poet Hafez, and I encouraged him to read some of Mahatma Gandhi. His family came over from the playground and I felt deep love and reaching out the humanity in each other. I took a picture of Hamid with his family and they took one of me with Hamid. Our encounter was brief, but we experienced a deep brotherly feeling between us and we touched one another’s souls! I wish everyone could have this kind of experience across the barriers of nationality and religion and enmity by our governments, and discover our common humanity! In the cities we have visited so far most of the women wear the traditional "chador." Much like the traditional nun's garb, the voluminous and far from form-fitting black gowns conceal all but the face and hands — providing no other clues as to woman's appearance. Of course it is impolite to stare — and even more serious here where absolute modesty is a legal requirement. As a consequence, both men and women must rely on the surreptitous glimpse. I cannot speak for womanly skills, but I have seen that Iranian men have also become masters of the accidental glance. Visitors quickly become equally accomplished. I have supported myself since finishing graduate school in 1970, and am the sole woman on this delegation, travelling with five splendid American men, including my husband. Nothing here fascinates me more than impact on women’s lives of living under the scarf and the veil. Early in our tour, our debonair chief tour guide Mr. Mardom explained that according to Islam, women should be covered so that men do not look at their bodies but instead evaluate them as human beings. On Monday, at the Tehran Museum of Contemporary art, I enjoyed looking at the paintings and sculpture, but more absorbing was the chance discreetly to survey the people in the galleries. Naturally all women had on scarves of some description. Some beautiful young women have carefully arranged little bouffant poufs of hair visible before the scarf starts. Some sport jeans and a tight fitting top that nearly reaches the knees, just fulfilling the required coverage. Many are either in a full chador, or draped in yards of black fabric. The black fabric can have lace trim, and is often woven with a lovely black on black pattern. I was of course wearing a scarf myself, observing the national law. There were several couples in the galleries, and a few men, but the majority of viewers were women. I surreptitiously studied them as they viewed the exhibit, and stood for a long time watching the four women who, along with a couple of men, were sitting at easels painting in a hallway near a big window. The women painters were mostly painting portraits of women. As I roamed the museum, I took pictures of a painting here and some calligraphy there, but most focused on a woman in the frame looking at the art. That evening, we went to the offices of Miles for Peace. This is a wonderful project under the auspices of a government authorized nonprofit, Mercy for All, and the Foreign Ministry had made the appointment for us. We saw a movie of their 70-day bicycle tour around Europe and the United States, staging press conferences and talking with everyone they met about how Iranians want friendship with Americans. We were fed divine pastries and tea, and heard from an athlete about his plan to swim the breadth of the Persian Gulf as a statement for peace. The most telling moment for me was when we first climbed the steps and walked into the suite of offices. There were over twenty people waiting for us, all of them bidding us welcome. About half were women, flashing such open, intimate smiles to me and taking my hand to say “You are welcome. Thank you for coming to Iran.” My heart swelled from the warmth extended to me. I feel as if the scarf is creating a shared experience and intimacy among women. Don’t tell the authorities, but Sisterhood is Powerful. After a week in Iran, an American visitor recognizes a pattern of conversation in chance encounters with Iranians. An older man sees our group and asks, “Where are you from?” After we tell him, he replies, “Welcome.” Another day a student spots us and spontaneously says, “Welcome.” We thank him. He then asks where we’re from. A third variation registered in Esfahan. A tall young man walking with two friends says, as he passes us, “Welcome. I hope you enjoy our city.” We called down the street, “Thanks.” Then there was the young man in a crowd at a busy intersection. Without any prompting, he said, “The most dangerous thing in Iran in the traffic. Be careful.” He’s right, and we have been following his advice.